This detailed information is intended for participants only. Additional general information can be found on the summary page. Bear in mind that this is the first time we've ever offered this trip, so there are some details that we're still working out. Rest assured that we'll fill in the gaps in the coming months. Alaska is full of surprises all the time, so always be flexible and see the unexpected as part of the adventure. If you have not already done so, you need to fill out the registration/information form for Arctic Wild online HERE. You can disregard the request for $500 down-payment... that is being handled through the festival. Check your email for further instructions from me on this. You are also responsible for your own transportation to Fairbanks. You must make an initial payment of at least 20% of the total trip cost in November, and after February 1, this is non-refundable. The full balance must be paid in full by May 1, 2018, and no refunds will be provided after that date. Food while in Fairbanks (July 27-29) - We'll be eating out at conventional restaurants. Food while in Bettles (August 6-9) - More detail on this below. Clothing and gear you’ll need on the trip. Depending on your level of preparedness, this may be less or more. There is a terrific gear list on the Arctic Wild website HERE, and we'll supply lots of instructions in the coming months. We encourage participants to purchase trip insurance. If you don't already have a company you use for this, we suggest you contact Greg Schlachter at Expedition Broker. While in Fairbanks: Private college dorms. These are not particularly modern, but clean and secure. Communal bathrooms on each floor. Cell service and wifi. Food and coffee within walking distance. Communal washers and dryers. While on the River: Your own tent. Meals prepared by guides with help from the group. No shower, but bathroom facilities literally everywhere. No electricity. No cell service. "For breakfast, we have typical breakfast foods (eggs, hash browns, bacon, reindeer sausage, pancakes, etc…). For lunch, we typically have hamburgers and a soup and sandwich option available. At dinner, it is the chef’s choice and in the summer we typically have pork chops, ribeye steak, or salmon. If you have any vegetarians or other special diets in your group, just let us know and we can do something special. As for the prices, breakfast is $15, lunch is between $15 - $20, and dinner is between $25 - $45 depending on the meal being served." 2017 participants out to dinner at the Pump House. Participants arrive. Try to arrive at the airport before 2:00 PM. If necessary, you can arrive on the previous day and we'll arrange for you to check into your dorm room one day early for an additional charge of just under $30. We'll be able to provide transportation from the airport for everyone arriving on Friday and those arriving on Thursday will get detailed instructions on how to catch a taxi/Uber/Lyft to where you need to go. Check into dorms at University of Alaska Fairbanks. 3:00 PM - We'll have an initial meeting in the lobby of the dorms. Attend a concert at the Fairbanks Summer Arts Festival. We don't know the schedule for 2018 concerts yet, but in 2017 this night included Opera/Musical Theatre and Jazz Big Band/Afro-Cuban Band. 2017 participant Aaron Keyt contemplates John Luther Adams' remarkable real-time sound installation "The Place Where You Go to Listen". Have some group hang-out time as we get to know each other. Eat falafel. There's an AMAZING place in Fairbanks with falafel pitas to die for. Meet the performers in Corvus. Visit the Museum of the North to see John Luther Adams' iconic sound installation "The Place Where You Go To Listen". Attend FSAF concerts. The Festival's orchestral concert always falls on this night, usually followed by something rowdy at a local hangout (in 2017 it was Afro-Cuban Band and Vocal Jazz). Hang out a little more with Corvus to hatch plans. 2:00 PM - Get an orientation session with our guides at Arctic Wild. The stuff that you'll be taking on the river. The stuff that we'll be shipping to the National Park Service office in Bettles to meet up with on August 6th. This will likely include computers and street clothes. This will be your last night in the dorms. We'll be traveling into the park from Coldfoot on a plane similar to this Beaver (with tundra tires) operated by Coyote Air. July 30 (Monday) - see Arctic Wild website for additional details about this portion of the trip. Meet our Arctic Wild guides at the airport. Leaving Fairbanks we fly 200 miles, over the Yukon River, to the small town of Coldfoot. We then catch a smaller plane for a spectacular flight to the North Fork of the Koyukuk River. We set-up camp and enjoy our first night in the wilderness. We have a full day to settle into our wilderness home. The hiking is good here in the headwaters and we will explore on foot from camp, getting to know the place and the routines of life in the Brooks Range before we start the canoe trip. Assemble canoes (yes... that's a thing). Set off onto the North Fork of the Koyukuk - a small, clear little river which we'll spend the next five days enjoying. It is alternately fast and rocky and calm and sandy. The river calms for our last few days of paddling before joining the Middle Fork of the Koyukuk. The village of Bettles, AK is located 35 miles north of the Arctic Circle along the Koyukuk River. The population as of 2010 was 10. 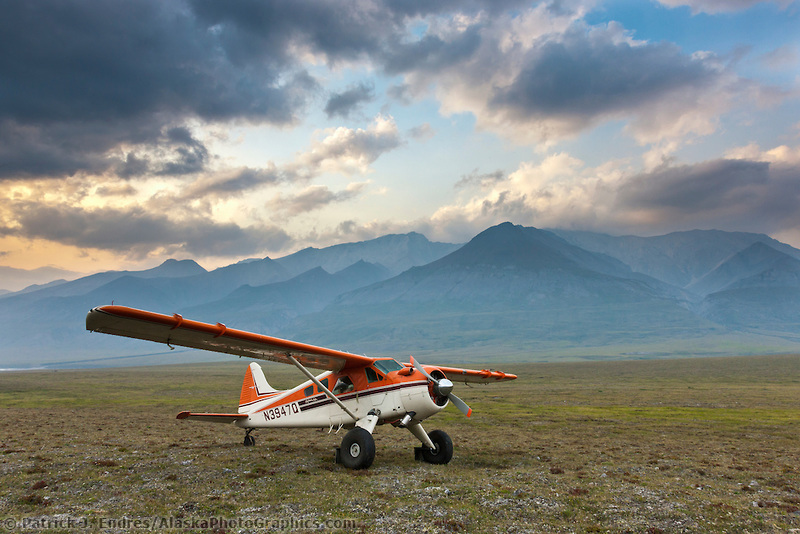 It's location and airstrip make it the ideal gateway community to some of Alaska's most pristine wilderness areas. A final morning to enjoy the solitude and camp routines before we paddle the remaining miles to Bettles. 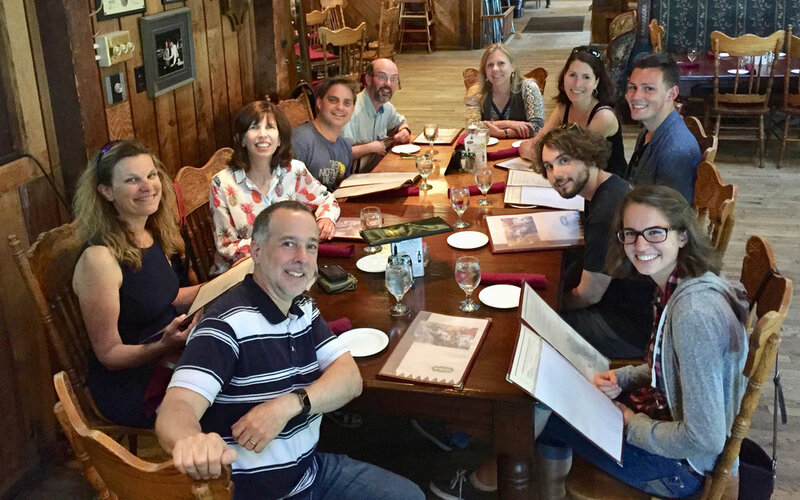 Here we'll be saying goodbye to our Arctic Wild guides, meet up with the things we mailed, and get settled into the Fish and Wildlife Bunkhouse. We'll be there at a busy time of year, and we'll be sharing the facilities with whoever happens to be there. This might include firefighters, scientists, visiting dignitaries, etc. Not to be overly dramatic, but last time I stayed in the Bettles bunkhouse, I met people who changed the course of my life. You may too. Depending on how crowded it is, we MAY have to stay four to a room here, so be prepared for relatively intimate conditions. We'll be such close friends by then, it will hardly matter. 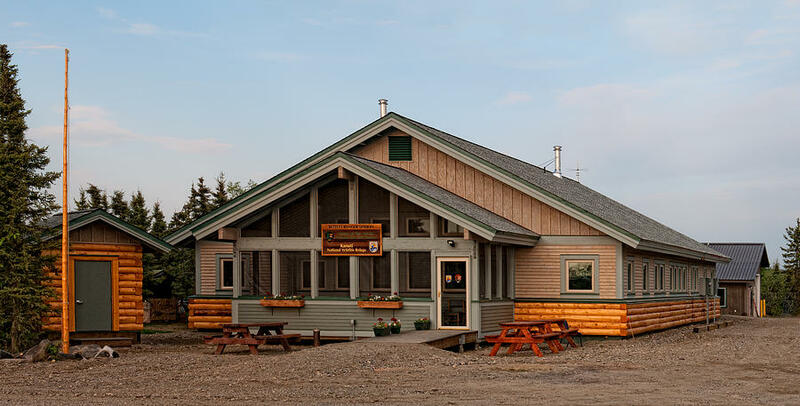 Bettles Ranger Station which serves as the visitors center for Gates of the Arctic National Park. Unstructured creative time. Our intent is that everyone will begin creating their pieces during these two days. Obviously, the bulk of the work will be done after you get home, but it will be far more meaningful and resonant if it is built out of initial materials that you created in a tiny fly-in-only town above the Arctic Circle... right? On Wednesday evening I'll be making a multimedia presentation to the general public at the Bettles Ranger Station about my music and the impact of their Artist-in-Residence program. Morning - clean, pack, and have our last group meeting. Afternoon - Fly back to Fairbanks. Most flights to locations outside Alaska depart late at night, so we hope that everyone will book flights that they can connect with later on this day. WHAT GEAR DO I NEED, AND WHAT SHOULD I PACK? For the river trip portion of the trip, see THIS gear list from Arctic Wild. Some things can be rented for an extra fee. If you happen to live in an area where backcountry gear of the right type is hard to find, consider arriving a day early in Fairbanks and just buying stuff there. They have four or five excellent outfitters including an REI. Street clothes for our days in Fairbanks and Bettles. Whatever technology you need/want for your composition activities. I'll have a Garmin InReach with me the whole time, and it will be updating our location every ten minutes to a website. So your friends and family will be able to track us in real time. You'll get a link to this website shortly before the trip, but they can always find it here on the the website (www.composinginthewilderness.com). Yes! (Bearing in mind that you are choosing to come to a wild place with wild animals and steep mountains and have a creative adventure.) At all stages of this trip, you'll be accompanied by guides, leaders, scientists, and National Park employees whose job is to make sure you are safe. You'll be given some instruction on how to handle bear and other wildlife encounters. You wouldn't be interested if you didn't want an adventure, right? But we'll make sure this adventure isn't your last. WHEN DOES THE PIECE HAVE TO BE DONE? We haven't figured this out yet. Once we have the date of the premiere nailed down, we'll work with the members of Corvus to select an appropriate date that gives you enough time to compose, while giving Corvus enough time to prepare the works. We have a relationship with Federal Hall National Memorial in lower Manhattan (right next to the New York Stock Exchange). They have agreed to host our concert, but we haven't nailed down the date yet. They have a spectacular and historical rotunda with VERY live acoustics. You can see a prior performance we did there below. LET ME KNOW WHAT OTHER QUESTIONS YOU HAVE AND I'LL ADD THEM HERE!